Start Your Own Shop... or Not? 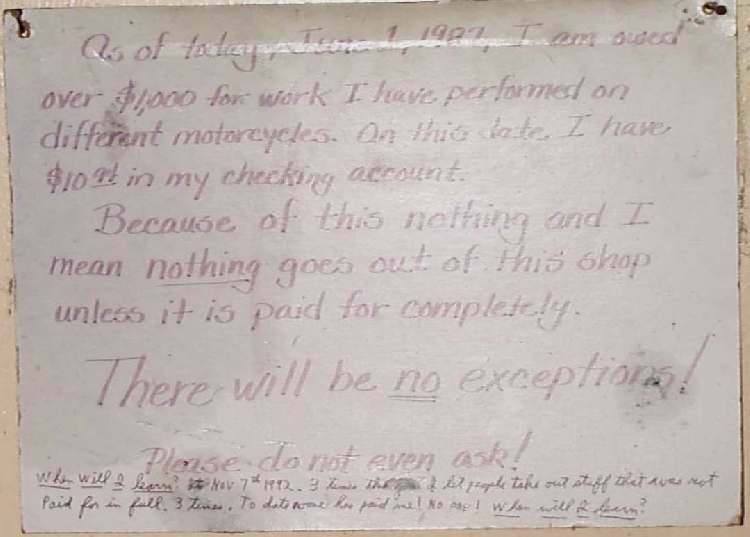 "...It was a true report that I heard in my own land..."
¶ Every once in a while someone asks about a career in Motorcycle Mechanics or starting your own shop. I'm not real sure what to tell them. I have been a mechanic all my life. My mother told me that, as a baby, I would take the baby stroller apart, and anything else I could get my hands on. So I guess God meant me to be a mechanic. I've loved motorcycles ever since I first rode an old Honda 55... and stopped it by dragging my feet because I couldn't remember where the brakes were. However, I do not recommend Motorcycle Mechanics as a career. I do recommend it as a hobby. Why? Well, for several reasons. Considering what you have to know and the number of tools you need, the pay is lousy. Unless you live way down south, you will only work half the year on motorcycles. Then they lay you off or you get to work on snowmobiles and snowthrowers... Yuck. Someone once said that working at what you love is like being on vacation all the time... NOT. If you twist wrenches all day you are NOT going to want to twist them at night, on your own stuff. You will want to do something else. (Like Computers!) You also develop a very mercenary attitude toward bikes. Nowadays, when I see a really great bike, I don't think "What a great bike to have and ride." I think "How much can I sell that toad for?" I read of a guy who collected baseball cards... just loved them. Everyone said he should open a shop and sell them. He did. 10 years later, he said that from the day he opened his shop till now, he had not added one single card to his personal collection. I know how he feels. Do you get the picture? But, you are not going to listen to me, are you? OK, here are some tips. Maybe they will help you. If you are just starting out, get an old bike, take my online course and have at it. Work on it, tune it up, rebuild it. Learn and get some experience. If you are real young, shoot even if you aren't, and really want to get started, go to your favorite shop and offer to work for $2.00 an hour or even for free. Be reliable and consistent. Work a few hours a day, several days a week. Whenever you can. Sweep their floor, clean their shop, wash their windows, run for parts or burgers... Make Yourself Handy. Do the stuff every shop needs done but don't have the time or money to do. Eat a lot of dirt. And like it, or at least act like you do. After awhile (may take weeks) they will see you are serious and start giving you little jobs and you will learn. If you start making them money you might even work your way into a real job. At the very least you will learn a lot. You will now have the experience to make an intelligent decision on any further motorcycle repair education. If you absolutely must start your own shop, do it part time in the evenings and on weekends. DO NOT quit your day job. Get your feet wet in motorcycle repair first. Don't risk your job till you are sure you want to do this. Do the best job you can and Charge for it. Charge maybe 20-30% under what the local shops charge. If you charge $20 per hour and the local shops charge $50, people will think your work is no good. Charge $35 or $40 and they will think they got a great deal. Charge for the work you do. If the bike is filthy and the bolts rusted on, it will cost more than if the bike is clean and well cared for. Cleaning bikes takes time and drilling out rusted bolts takes time... it has to be done... it takes time... charge for it. If you special order any part it must be paid for in full and is non-refundable. I've seen people order parts from 2-3 different shops and buy it from the one that gets it in first. The others? Tough luck for them. Sometimes they decide they don't want the part at all. Even if you return a part for credit you still have shipping (both ways) and a restocking fee. Doing business costs a lot of money. Lights, rent, ads, shipping, special tools, shop manuals. It all adds up and someone has to pay for it. Because of this you must charge enough for parts. How much? Well, you're not going to like this but I mark things up 100%. If I buy it for a dollar I sell it for two. Sound like a lot? I once sold a sprocket for a 40% mark up. When I figured out shipping, phone calls, etc. and threw my time in for free. It turned out I LOST 25 cents on the deal. You don't stay in business very long doing that. At 100% markup, you will at least break even, no matter how bad the deal goes. Keep good books. Not just for the IRS. If you are loosing money, you need to know. Speaking of loosing money. You need to have enough savings to last at least a year. Even if the business makes no profit that first year. Develop a really thick skin. You will not believe the things people say to you, without thinking about what they are saying. I like to think that they really don't know or understand what they just said. Just ignore it, forgive them and concentrate on doing the best job for that tworp, oops, I mean beloved customer, that you can. One time a customer called and wanted to bring in an outboard motor I couldn't get to it for several days and told him so. He asked if he could bring it in the next day. I said yes, but he would have to leave it. Next day he brought it in and I told him to leave it and I would get to it the next day. So he said "If I wanted it fixed tomorrow I would have brought it in tomorrow." I guess the guys in front of him don't count. He didn't bring it back, which suited me just fine. I was really busy. However, if he had I would have done the best job I could for him. When you decide to open your shop remember what all the Realtors say "The three most important things in starting a business are Location, Location, and Location." In other words, find out where your customers are and get as close to them as possible. If you think that you can give honest, fair, high quality service and everyone will beat a path to your door... think again. People go for easy and cheap. Don't get mad or upset when some guy shows up, after spending $500.00 with someone else, wanting you to fix it because they couldn't. And could you do it cheap too, because I already spent most of my money. Customers have selective hearing. They ask how much a clutch repair costs... you give a price... then they add a tune-up. They then expect the tune-up for free or really cheap because you already gave a price. Yea, I know... weird. You tell them not to "over rev the new rebuilt engine" and all they hear is "rev the engine". You must be very clear in your instructions and estimates. It is Ok to remind customers of the words "Good, Fast, and Cheap." He can pick only two! If it's good and fast, it won't be cheap. If it's fast and cheap, it won't be good. If it's good and cheap, it won't be fast. Make sure the location for your shop is zoned for a Motorcycle Repair Shop. You will need a resale tax number from your state to collect sales tax. You might need a business license from your city. You will also need to get either a business phone or change your phone number to a business one. I find I get a lot of business from the Yellow Pages. Other types of ads don't seem to work very well... at least for me. Your area may be different. I found those magnetic signs you put on your car doors to be worthless. I never got any business from them. But, again, your area might be different. Once you get the resale number and such, you can apply to different after market parts distributors and get accounts set up. For factory parts get a trade publication like "Dealer News" or "Motorcycle Product News" (User Name: "mpn", Password: "dealer") and look at the ads. There are a number of dealers who will sell you factory parts for cost plus 20% or so plus shipping. You must give them the part number. so you will need to get a Micro-Fiche reader machine and the micro-fiche for the machine you are working on. It is best to get the whole set for each make you work on. You will also find the fiche Online Computer handy for engine reassembly, especially for basket cases. A FAX machine is very handy too. UPDATE! As I write this (2006) the manufacturers are doing away with Micro-Fiche and are going to an Internet based parts lookup system. You need computer skills and you need to be Online. If you don't have a computer and computer skills, GET THEM! If you are not on the Internet you will have to get an internet provider and GET ONLINE! This is just the way it is. UPDATE 2015. Not much has changed. You can loose the Fax Machine. Most everything is now done Online. I have found you can get good deals at Ebay.com and Amazon.com on things like Gasket Sets, Brake Pads, and other motorcycle stuff. Lots of Web Sites now have online exploded parts books for most all makes and models. Lots of Web Sites and Blogs also cover common and not so common repairs on lots of different motorcycles. This is handy if you run across a problem that has you stumped. After you take a bike apart and give an estimate for the repair, get a deposit for the parts. Always do this. Then if the customer takes off, leaving you with the bike, you are only out the labor and not the parts. Yes, they really do this. I usually tell the customer that I will take the bike apart and work up an estimate. If they decide not to do the repair all they have to do is pay for my time. If it helps them, they can walk away and give me the bike. I give ball park estimates for free, but if they want an exact estimate and I have to spend a lot of time on it, they must pay for that time. I charge for insurance estimates. If they want it free... go somewhere else. Never, Never, NEVER, let a repair job go out without it being paid for in full. I don't care what type of sob story they give you. NEVER let a job go out unpaid for. Here is a sign I have in the shop. It's looking a bit old but it tells the story. Well, there you have it. Just remember, if I had it to do over, I would get a good job, make some money doing something else, and work on bikes as a hobby and have fun.